How Does Sitting Affect Your Running? We all sit too much. We sit all day at work, at the movies, at meals, driving the car… there is never a shortage of opportunities to sit. As a result, we're becoming increasingly unfit because of this sedentary aspect of our lifestyle. Sitting slows your circulation and your metabolism and is responsible for many other adverse effects. It's no wonder we're beginning to hear phrases like, "Sitting is the new smoking." Your knees are bent when you sit, which holds your hamstrings in a shortened mode for extended periods of time. This smaller range of motion can either slow you down or leave you vulnerable to a hamstring pull. If you slump when you sit (or drive) adds more curvature to your thoracic spine and flattens your lumbar spine. This shortens your psoas and hip flexors, and takes the spring out of your step. Sitting shortens your hip flexors, causing you to bend at the waist when you run. I commonly see this in cyclists and triathletes who spend hours on their bikes hunched over the handlebars. When they get off the bike to run, their hip flexors are tight and their legs can't go into a full extension. If your lifestyle requires you to sit a lot every day, here are a few things you can do to minimalize the negative effects of sitting on your running. Lift at the crown of your head whenever you're sitting. This increases your lung capacity and sends more O2 to your brain. Sit with your shoulders directly over your sitz bones (Ischial tuberocities) and your ears directly over your shoulders (balance your head on your shoulders). This strengthens your lower abs which stabilize your posture when you run. 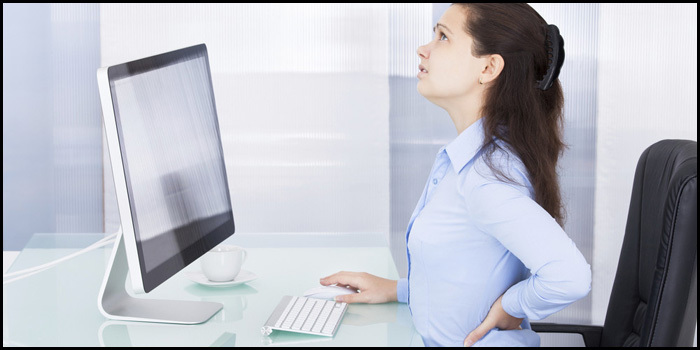 Use a lumbar support attached to the back of your chair. This keeps the curve in your lower back and keeps some length in your hamstrings while sitting. Set your computer monitor it at eye level so you can hold your head and eyes level while sitting. This will keep you from slumping and prevent neck tension. Set an alarm on your computer to remind you to get up, stretch lightly and walk around every hour. 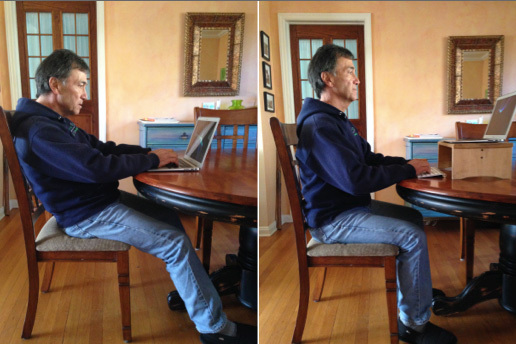 If you have a swivel chair at your desk, rest your forearms on the desk while you swivel your chair seat. This will twist your spine and keep circulation to the muscles along the spine. Do leg lifts throughout the day. Sit upright in your chair and straighten each leg, holding it extended and parallel to the ground for 3-4 seconds. Then, do the same for the other leg. This keeps your hamstrings stretched and healthy. Just because you have a job where you sit all day doesn't mean your running has to suffer for it. It might sound like a contradiction, but the best thing you can do for yourself is to keep moving while you're sedentary. Doing these little exercises can make worlds of difference when you get up to move. ChiRunning® is the world’s leader in teaching safe and efficient, natural running technique to reduce injury and improve personal performance. The mission of ChiRunning® is to help you love running forever. ChiRunning is based on movement principles of T’ai Chi, but you don’t need to know T’ai Chi to ChiRun. All you need to know is how using your core can transform your running.